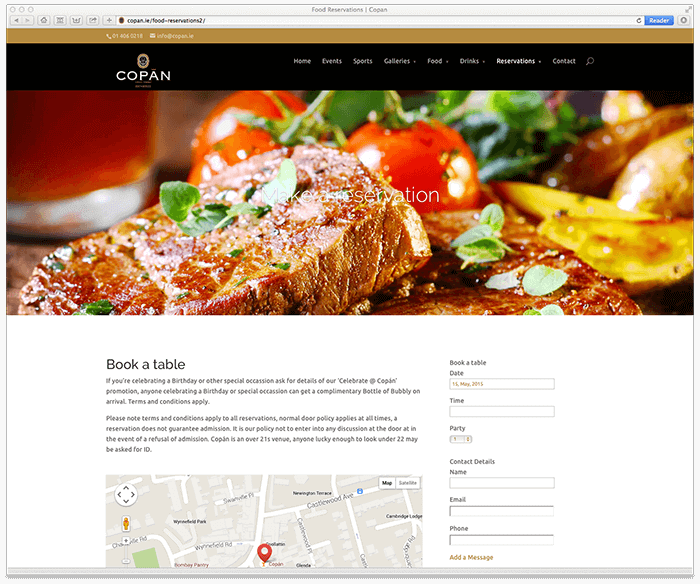 Copán restaurant and bar, Dublin, has seen bookings and overall turnover increase since it launched its new optimised, responsive website – designed, implemented and hosted by Nettl. 75% of all booking now arrive online through Copán’s new website, a trend which is set to continue in 2015 and beyond, especially as the latest research reveals more than half of all web visits now take place from a mobile device in the UK*, and Ireland is quickly following suit. The Central American themed establishment was looking for a visual refresh to appeal to the professional clientele it attracts, to increase functionality, speed up and increase efficiency of the booking system, and for a fully responsive system to meet the needs of today’s mobile, tech-savvy customers. Previously, the website did not allow online bookings and was not updated regularly – which was often a turn off for potential customers. It also created more manual administration for staff and added to the workload of the bar manager and reservations team. The new website launched in February 2015 and as a result, the number of hits to the website has also doubled in this short space of time and the business has seen even further sales growth which bosses say they are in no doubt is attributed to the impact of the new website. The fully responsive system works across mobile phones, tablets, as well as computers, and the website adapts its layout according to the type of device it is being viewed on. It also links to Copán’s social media feeds, to allow customers to interact and engage with the venue, provide feedback, post images and share experiences. Ciaran adds: “The new website has certainly generated more interest and customers can browse menus and events for inspiration, plus we have recorded a 54% increase in bookings. They can also make reservations with ease, and we can run and view reports either daily, weekly, monthly, or for longer periods. We do still receive some bookings over the phone or in person, but the website is our main source for reservations and we have incorporated this into all our marketing material, to direct potential customers to our enhanced system. Nettl of Dublin‘s Matthew Duffy says: “Copán has been a great project to work on and we are delighted that the site has led to such a significant increase in bookings and turnover. “Since launching Nettl last year we’ve lost count of the number of times new clients have told us they have been meaning to sort out their website. Now, it’s more important than ever for restaurants and bars to recognise the benefits of responsive websites to suit the changing needs of today’s consumers, particularly as Google now ranks mobile-friendly websites higher within searches as of 21st April. The popular restaurant and late night bar is a thriving business and it approached new Dublin-based web studio, nettl.com to carry out a complete overhaul of the company’s website in response to changes in customer booking habits.